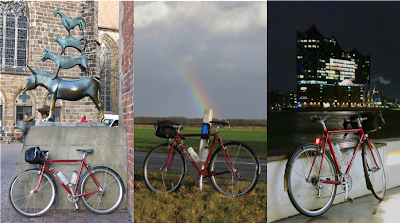 With the brevet season starting soon its time to think about a little longer rides. And when the forecast announced a moderate breeze from south-west, we decided to go for a sailing trip from Bremen to Hamburg together with Jakob. The idea being to claim a few kilometres back from the wind. 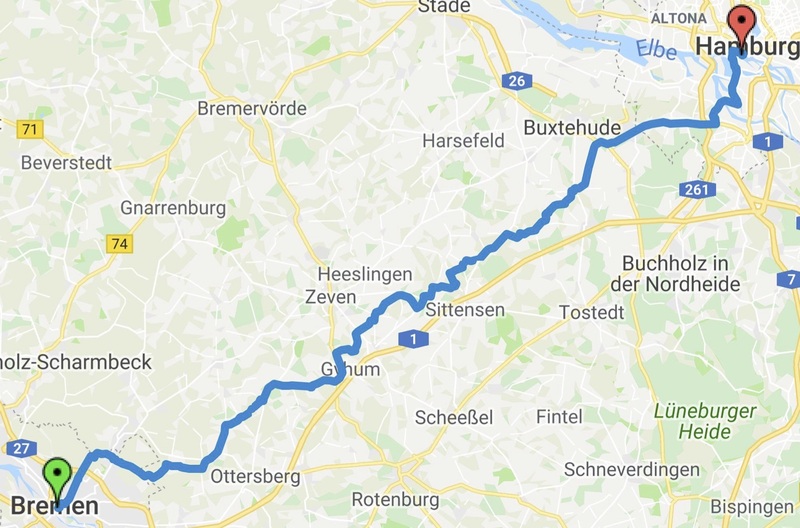 After plowing into a constant headwind for 280 km straight during the time trial Hamburg Berlin lately for example, I didn't feel guilty to take advantage from the reliable tailwind that was announced for this choice of route. before the old St Pauli Elbtunnel (currently only pedestrians and bikes). And it makes for a music themed ride from the Bremen Town Musicians to Hamburgs new landmark. Following largely the route of the bike trail Bremen Hamburg, large portions of the trip were on absolutely beautiful backroads free from traffic, - and open to the favourable wind. The wind forecast for Germany the 09.02.19 at 15h at 10 m looks promising. Our ride direction indicated as a pink arrow. The only thing we hadn't really anticipated were a few good spells of rain as part of the trade. 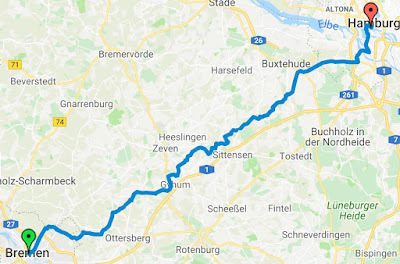 Worth every kilometre, with the exception of the bike path along the busy state road between Neu Wulmstorf and Harburg, before the nice finish in the heart of Hamburgs harbor and with a crossing of the St Pauli Elb-tunnel.